We can make long lists on Jerry Dipoto, things he's done well and not, but there's one thing he absolutely hammered: "Lengthening the Lineup." Quotes emphasized because it was one of the first phrases he used publicly after replacing Jack Z. With respect to Seth Smith, IIRC. I think there's a decent chance of that proving true. Split by place in the order in 2017, by OPS it goes 3,4,2,5,1,6,7,8,9 with only incremental drops until 8th @ .707 to 9th @ .581. Numbers on the left are 2017 mlb avg OPS+ by batting position, on right are that players actual 2017. Cano and Gordon are the 2 most suspect by the 2017 numbers. I like those numbers. I liked Heredias .734 OPS through the 23rd of August, when the injury...Beaned in the forearm multiple times in a week? This is a thing now? OK. Then he played the final 28 straight games amassing .377 OPS of futility. .734 to .652 in a month. Now everyone sees a much lesser player than he was every time they see his 2017 line. Hoping for a swift recovery. He's still going to be my 2018 jersey. 1) Moe's pre-action that Robinson Cano makes our #3 slot our weakest Yahtzee score, which provoked Wishhiker's analysis. 2) Sherminator's reaction that 2018 could see a Mariners' lineup that is BTA (scoutspeak for above average) at EVERY one of 9 different Yahtzee slots. This is a kewl observation that SSI will track all during 2018. 3) Jemanji's reaction: what does "Wish-hiker" mean, anyway? 4) Sherminator's later reaction: man, we sure gotta lotta 3 WAR players. Slots 1-7 could, maybe should, all produce that in 2018. This gives us a "fat" talent pyramid (at the 25-man roster level, Gordon would wryly point out) and gives Jerry Dipoto full credit for a longggg lineup. 5) Hit and Run's observation that the 2001 Mariners didn't go into that season looking like 116 wins, not at all, and if you turn your head sideways to look, this team could be viewed kind of like the 2000 M's. The Mainframe's response to H&R? You're probably more right than you realize. Bill James has pointed out that the 2000 and 2002 M's both lost -25 more games than the 2001 M's; what happened in 2001 was that a very dynamic team had everything go right. Let's not be so cynical that we overlook the fact that Dipoto has built a similarly DYNAMIC team. This "fat pyramid" team is one for which, IFF "everything goes right," you could see great things. Dr. D would like to climb out on the limb again, standing smilingly on a bouncing branch like Chow Yun-Fat in Crouching Tiger, and re-commit to his Very Best Bet shtick on Mitch Haniger. And he doesn't even have to hit much to get 3 WAR! He gets you WAR with his glove, he gets you WAR with his legs, he gets you WAR with the position adjustment (just being an average RF is worth a lot), and at a 100 OPS+ he'd be around 2.5, 3.0 WAR. Best Bet, baby. The guy can play for my team any time. Hope he gets 10 years in at Area 51 and winds up with Alvin Davis and Jay Buhner in the M's Hall of Fame, such as it is. 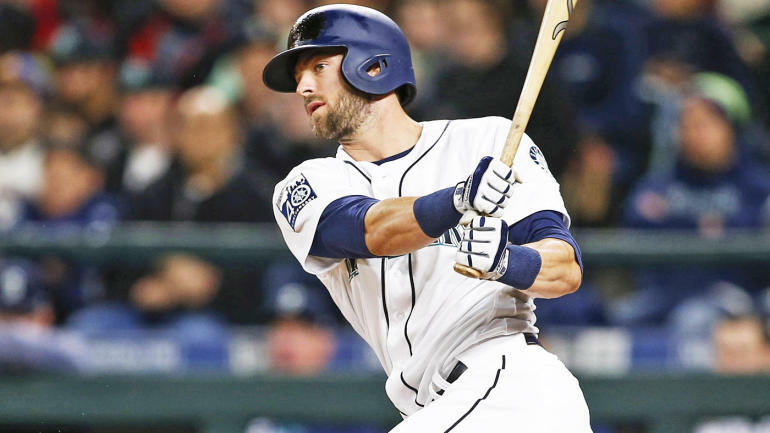 Haniger, Zuumball, Gordon, Segura, a lot of guys will be playing for the Mariners, playing cheaply, and playing very well. What about the 3-4-5 hitters? It's becoming a bit of a truism that Cano and Seager don't even matter that much any more; they hit 3/5 but in 2018 may be our 6th- and 7th-best players. Boomstick, that's a big problem. Dipoto simply is not going to pay $200M to replace his bat. He's gone after 2018, unless he's willing to do an Edgar thing and sign for 2 years late in his contract. It's not good enough to take Haniger's and Zunino's 135 bats and call the job done. When's Tyler O'Neill due again? ... Hm. Maybe G-Money will chime in on Kyle Lewis' plausibility for the 2019 season. Or maybe one a' you mooks see a cleaner path towards 2019 Happy Totals. But like Hit and Run sez: Wish's and Sherm's add-ups leave us with the possibility of a huge 85th-percentile 2018. The MOTO that's even invisible to Johns, right? Haniger at 3, Zunino at 4 in 2020. By postseason 2018 maybe even. They were #2 and 3 in hitting last year, even working through different issues. With no Cruz I'd probably have Cano 5th after the 2 younger spark plugs. Notice that Man, Zuum and Boom were the guys over league average at any batting position. Edit:just noticed I spelled Healy wrong. Him, Seager, Gordon, Gamel, Heredia and even Cano could also improve on their 2017. By also I mean as well as Mike and Mitch. Theres your 85%, which could possibly lead the majors. 5 players with 120 OPS+, another 5 over 100?